This jacket is just perfect! I hope you'll feel better soon. Such a beautiful outfit! I love the boots and jacket! Sei sempre troppo peretta!!!!!! adoro ogni outfit ogni foto, ogni post!!! posso essere te?? Ps che programma usi per dare questo colore alle foto? Gorgeous look! Perfect to enjoy the last days of winter! You look cozy and chic, the boots and the jacket are amazing! That jacket is gorgeous, love this look! Perfection from fur to shoes! Oh my! 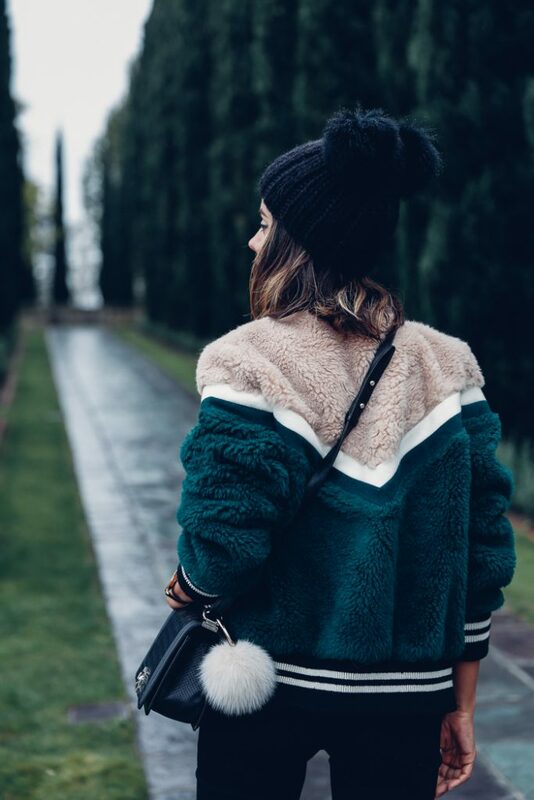 I´m so in love with this bomber jacket!! Great outfit! Love the coat and how you styled it! Such a great look! You look amazing! Feel better! Hope you feel better soon! <3 I'm the same way, just can't sleep when I'm sick! On the other note, I love everything about your outfit, especially those boots! I´m in love with this look! The fur bomber jacket is so so cool! I absolutely love this look! These boots are everything <3 A perfect look for everyday – good job girl! Such a nice look. I love that cute hat. I hope you are feeling better now. What helps me is massive doses of vitamin C.
Amazing look as always! Love the jacket, it's very cool! I love everything in this look but those boots! They're perfect! What a beautiful outfit! This look is amazing, specially the jacket! ♥ Additionally the background looks wonderful. You look so beautiful and the outfit it's so stylish ! I definately would wear this kind of jacket! Get well soon,cause I love your blog posts! The texture of your cat really adds depth to your entire outfit! Love this look on you. I am absolutely obsessed with your flats!! Oh man, I was hoping the actual jacket you're wearing was available. I'm in love with bomber jackets right now and I love the furriness of the one you're wearing! Adds that extra aspect to it, you know. My boyfriend wants me to wear a short dress without underwear on a night out in club, he told me it would be a real turn on for him if i do that, and he will make it up to me. You have some tips for me to avoid embarrassing situations? O M G !!! This BOMBER JACKET *. * Damn. Such a cool piece. Have to get my hands on a similar one. How do you get stylish but comfortable high heels? I absolutely love this jacket!!! this look is incredible! I love your cool and unique looking jacket!